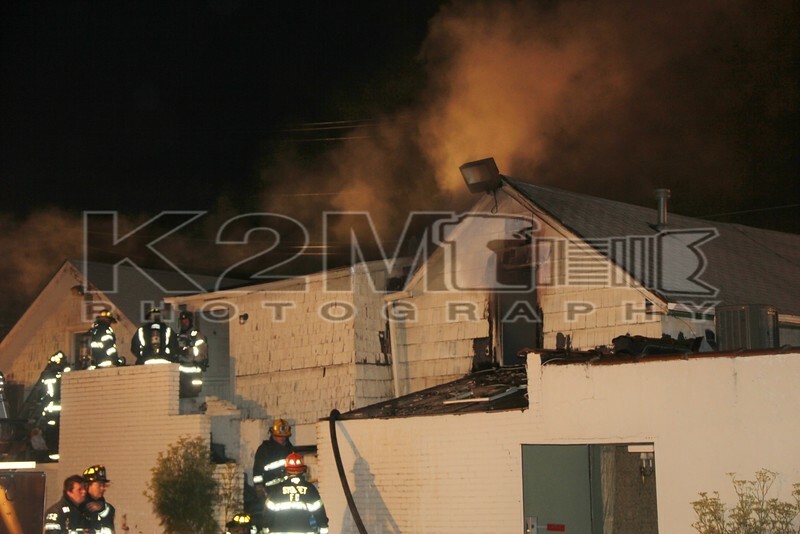 In the early morning hours of July 7th, 2012 the Syosset Fire Department responded to the Caracalla Restaurant for what would be an extensive fire that consumed much of the Italian eatery. The location of the fire was 102 Jericho Turnpike, just off of Underhill Boulevard and after primary investigation it was found that the fire began in the basement of the two story building. After starting in the basement, the fire worked its way up and was prevalent on all floors of the building. Three lines [two of them two and a half inch hand lines] were put into operation to fight the fire. As the fire moved upwards, it burned away staircases inside the structure and severely compromised the second floor. When one of the building’s staircases gave way, a Syosset firefighter fell one floor downwards; however, he was spared further injury by an Assistant Chief and Ex-Chief below. The fallen firefighter’s actions resulted in a mayday transmission; he was then removed from the building, transported, and will recover. During operations, when the second floor began to weaken, firefighters were evacuated from that level. This made it difficult to ensure all fire was out on the top floor as fire was hiding inside the aged walls. Because the fire building was a commercial structure and the early morning was dominated by high heat and humidity, extensive mutual aid was called to the scene. Many of these mutual aid units were put to work because of the heat, widespread overhaul that needed to be done, and fire load. Mutual aid to the scene included [but was not limited to]: Jericho Ladder 941, Hicksville Ladder 931 and Engine 932, and Oyster Bay Ladder 554. Also on scene were ladders from Plainview, Cold Spring Harbor, and Bayville with engines from Bethpage and East Norwich. Due to the aforementioned conditions faced by firefighters on scene, multiple ambulances were requested to the scene and to stage in the parking lot across from the fire building. Bethpage, Melville, Glen Cove EMS, Farmingdale, and Plainview were among the towns requested to send ambulances to the scene. Plainview also sent their Rehab Unit  to the scene to provide exhausted firefighters relief. In all three firefighters were transported [one a fall victim, two from heat exhaustion] and all will recover. The fire was declared under control [signal twelve transmitted] approximately ninety minutes into operations. The fire marshal’s presence was requested to the scene immediately to investigate the cause of the fire. The restaurant was closed for the night at the time of the fire, and all fire department units were under the command of the Syosset Chief of Department .